Client Review (Child Custody) – “Brian is professional, intelligent and trustworthy. Brian has been our family attorney, fighting for our rights during a challenging custody case. Our legal situation is complex and emotional and Brian offers patience and understanding. He understands the law and delivers results. We would highly recommend Brian." ~ Megan See more client reviews. Brian A. Coverdale has been working with the firm since 2010 and is a partner with the firm, practicing in both Pennsylvania and New Jersey. Born and raised in Doylestown, Brian has deep ties to Bucks County and the surrounding areas. A staunch advocate of his client's rights, Brian is prepared to represent his client's interests to the maximum extent possible. Brian takes a customized approach to handling all of his cases and formulates a targeted legal strategy to fit each client's individual needs. With his divorce and family law clients, Brian takes a pragmatic approach to help his clients reach the best result possible, without paying unnecessary legal fees. By way of this approach, Brian ensures that each client maximizes his or her equitable share of the marital estate and is awarded his or her well-deserved custodial rights as parents. From the very beginning of his career Brian A. Coverdale has shown his proficiency in the Courtroom time and time again and has made his presence well known in the Courthouse. Brian appears in the Bucks County, Montgomery County, Burlington County, and surrounding County Courthouses with regularity, often appearing more than three times per week. Brian uses a proven approach through meticulous preparation and outstanding presentation in the Courtroom which equates to success in client representation and advocacy. Mr. Coverdale is certified by the Institute of Divorce Financial Analysts as a Certified Divorce Financial Analyst (CDFATM). The Institute for Divorce Financial Analysts (IDFA™) is the premier national organization dedicated to the certification, education and promotion of the use of financial professionals in the divorce arena. 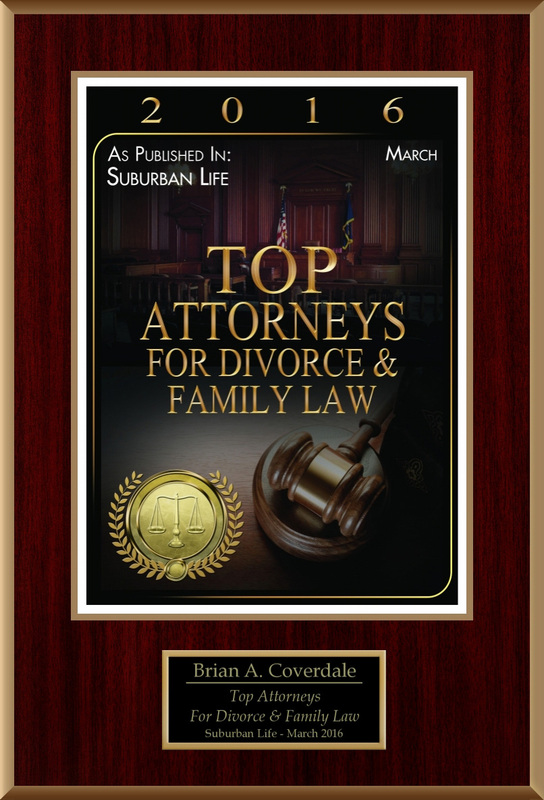 This certification denotes Brian as highly proficient in the area of financial matters regarding family law. He is also a member of the American Bar Association, Pennsylvania Bar Association and the Bucks County Bar Association. Mr. Coverdale's practice focuses on strategy and litigation for high net worth individuals going through divorce and property division in Doylestown, New Hope and surrounding regions in Bucks County. He provides clients with extensive data showing the financial effect of any given divorce settlement and helps them to determine how much risk they are willing to take with their investments. As a financial advisor, Mr. Coverdale assesses the short-term and long-term effects of dividing property, and advises clients of the firm about specific tax laws that apply to divorcing couples. He analyzes pension and retirement plans and calculates the present value of pensions for purposes of equitable distribution of property for clients going through divorce in Pennsylvania. Most importantly, Mr. Coverdale assists his clients in identifying their future financial goals post-divorce, which includes determination of earning capabilities, establishing assumptions for projecting inflation and rates of return, collecting financial and expense data and determination whether the client can afford the marital home, and if not, what he/she can afford. In cases of divorcing clients with children, he helps his clients to determine what expenses they should anticipate while dividing the property, in terms of their children's educational expenses and its impact on their retirement objectives and the lifestyle they anticipate after divorce. In terms of recent accomplishments, Brian won a Pennsylvania Superior Court appeal, resulting in the reversal and remand of a trial court custody decision in Bucks County Court of Common Pleas. In this appeal, Brian successfully proved that the trial court made errors of law and abused its discretion in awarding sole legal and physical custody of a minor child to one parent. In winning the appeal, Brian overcame a very difficult burden of proof, and few attorneys in Bucks County, can state they have successfully overturned a trial court decision, given the weight of discretion given to a Common Pleas Judge. This is just one example of how far Brian will go to ensure his client's rights are upheld. Brian received his J.D. degree from the Delaware Law School. While in law school, Brian was a member of the trial advocacy honor society and served as a certified legal intern with the Bucks County District Attorney's office. While working at the District Attorney's office, Brian was the sole Commonwealth of Pennsylvania representative in over 100 Preliminary Hearings, with over 300 charges held for trial. For his performance at the District Attorney's office, Brian was the recipient of the John A. Wagner, Jr. Memorial Award and a Certificate of Appreciation from District Attorney David W. Heckler for excellence in prosecution. Prior to attending law school, Brian had a career in Regulatory Compliance, Environmental Health and Safety, and Worker's Compensation for over ten years. Upon graduating from the Indiana University of Pennsylvania, Brian worked for two Fortune 500 companies, General Motors and the Penske Corporation, as a Regional Manager of Regulatory Compliance. Brian also is a former Certified Hazardous Material Manager (CHMM) and a former Certified Safety Professional (CSP). Brian's practical experience in Transportation Law and Environmental Health and Safety provide him with the knowledge and expertise necessary for any successful Personal Injury, Toxic Tort, or Workers' Compensation, which are also his practice areas of focus. With his experience, he knows more information about the inside strategies to defend against accident plaintiffs. Brian also speaks conversational Spanish and can communicate with clients needing Spanish language services.